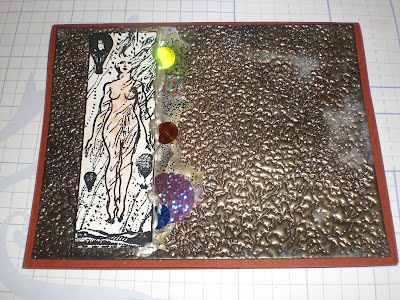 Today, I taught a the Cracked Glass technique class for the CTMH Virtual Convention. I think it went really well, especially considering I've never done a "chat" style class before...no pics. Everyone who responded seemed to love the technique. 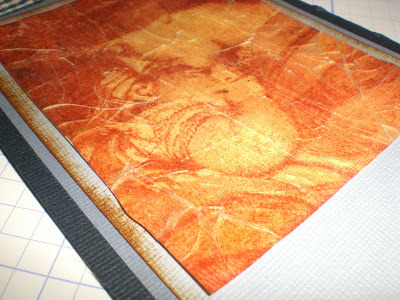 During the class, I promised that I would post some pics of a past card that I did using the cracked glass technique. I also promised that I would post pictures of the cards I made years ago when I took a class from the famed Suze Weinberg. Like I said, I made these a long, long time ago...maybe 12 years, I think. 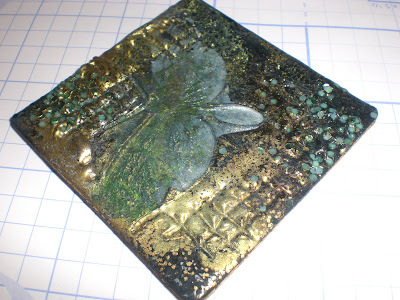 So there has been some deteriation, like oxidation of the metallic embossing powder and broken embossing, etc., but I think you'll get the idea of the possibilities. First is the card I made using a Magenta stamp. I used this stamp for my son's birth announcements (9 1/2 years ago) and loved the stamp so much, I decided to play with it some more. 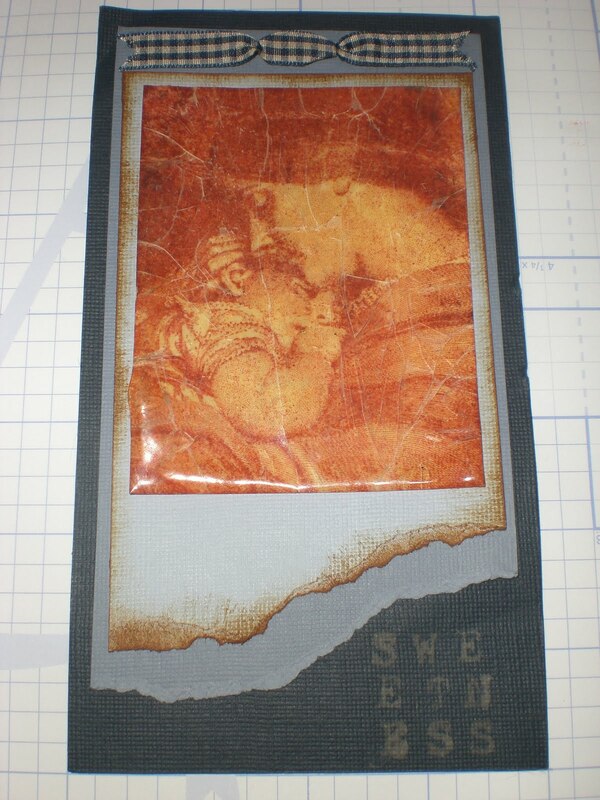 I wanted it to have an antique feel, so I used a brown-type ink (though it looks kind of orange in the photo). It's okay if the embossing isn't "perfect". Notice the area where the melted embossing dripped or ran off the side? I also used bleach to stamp the letters. 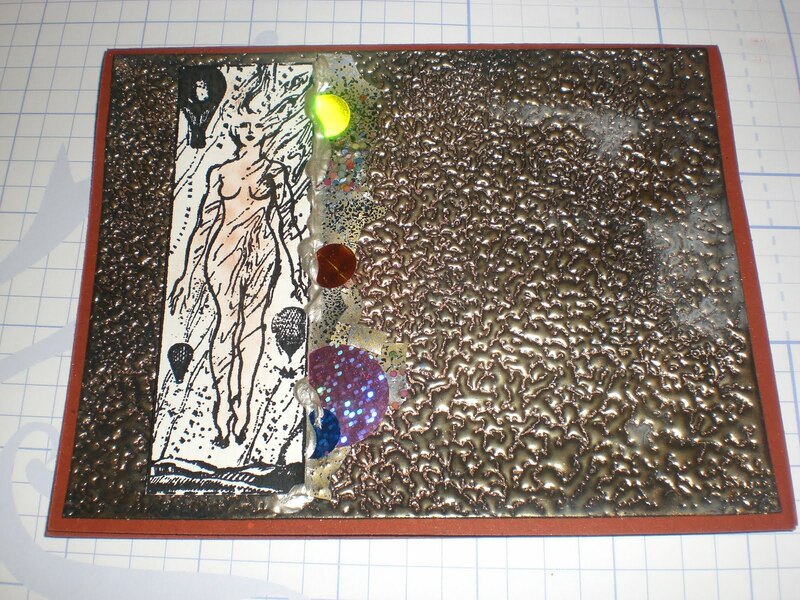 Here is one of the cards that I made in Suze's class. You can achieve the look of the gold UTEE (Ultra Thick Embossing Enamel) by only applying one layer. This could be done with clear UTEE to creat a wet, water droplet look. Also, notice the little chips tucked along the right side of the lady image. 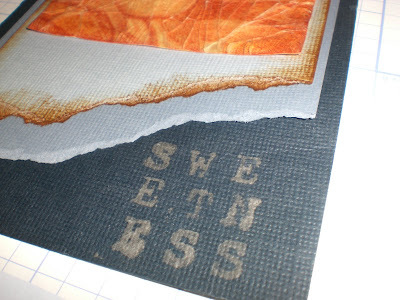 If you put embossing ink (or VersaMark) on a craft sheet, sprinkle embossing powder on the ink and then heat emboss, when it cools, you can peel it up. It will be brittle and you can break off pieces and tuck it into the side using Liquid Pearls. 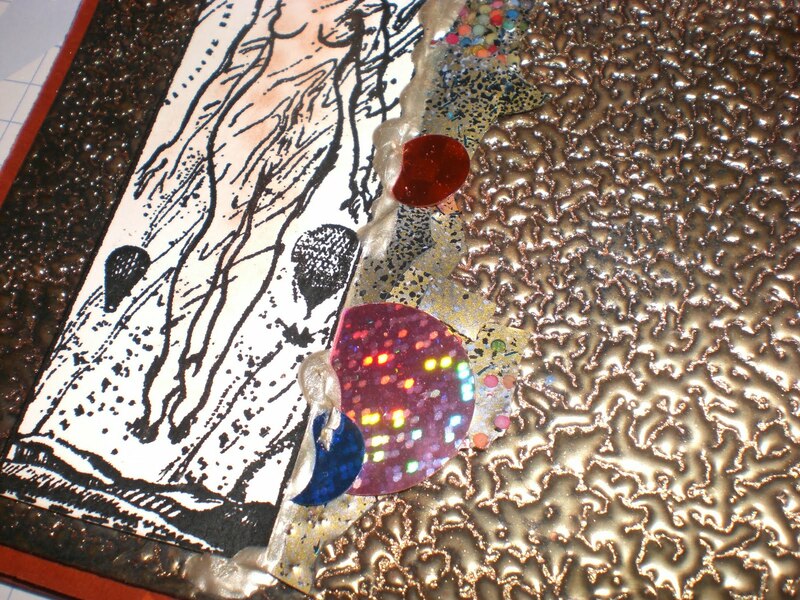 You can also add Suze Weinberg's Ultra Effects, Suze Weinberg's Mini Mosaics (little colorful round specks). You could make your own confetti, too. I'm sorry that I'm unable to give credit to the rubber stamp company, but again entirely too long ago and it was Suze's stamp. This item is actually a pin. It is simply a square piece of cardboard. Ink the front in black ink...probably a pigment ink to help the UTEE stick. 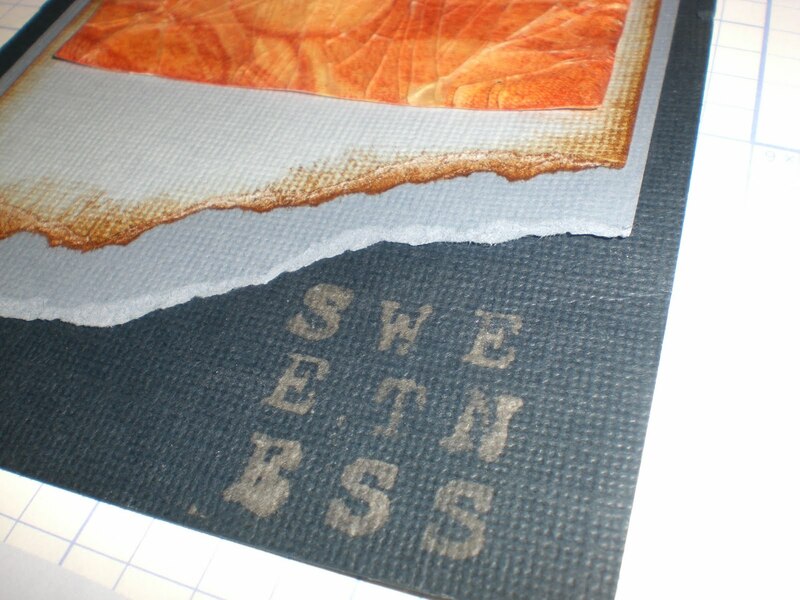 You could probably do a dye ink and then an embossing ink or versa mark on top of that, if you don't have pigment ink. 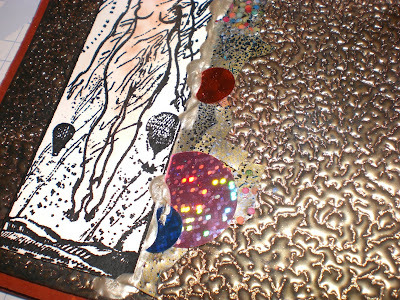 We then melted layers of UTEE, sprinkling on different colors. If I remember correctly, I also used at least one of the UTEE interference colors. I can't remember if I stamped the image in ink before stamping it into the molten embossing, but I think I did. I do know after stamping the image, I heated up a couple of spots to add the Beadazzles. When it cooled, I rubbed Pearl Ex on in various spots. Notice that again, it's not "perfect". There are air bubbles where the UTEE boiled a little, I also...for some reason...didn't get the UTEE all the way to the corner, the UTEE flowed out to the right, but I love it! The back was covered in black cardstock with a pin back attached. This piece is also on a square piece of cardboard. Same idea as the card above, but we used a background stamp (I think) to make the gridded background, then stamped the dragonfly afterwards. 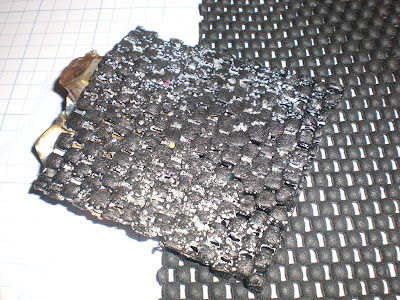 This also used mini mosaics and both gold and black UTEE. 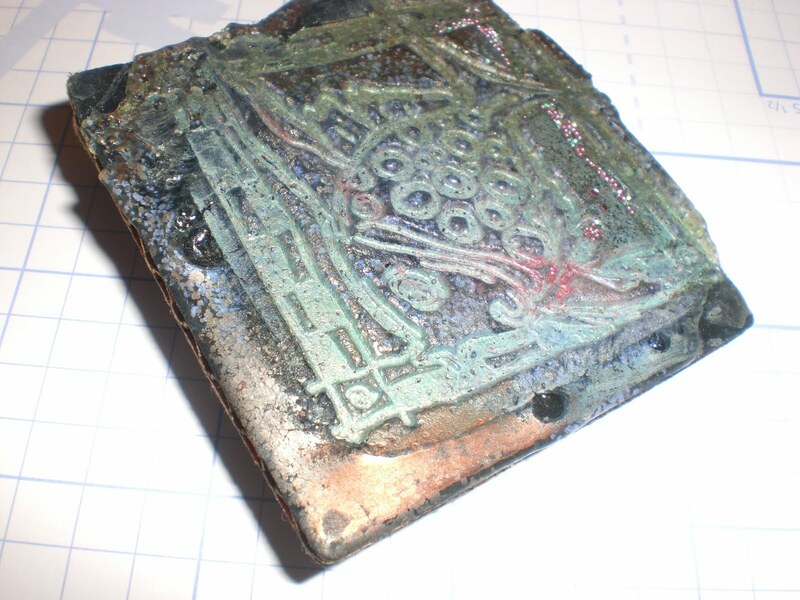 This final item has oxidized pretty badly (probably due to the material it was stamped on. 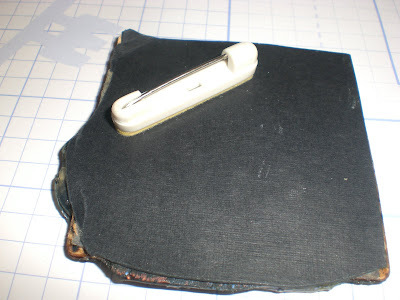 However, the material was one of the cool things about this project....rubber shelf lining! That's right...that cheap stuff you can buy to line shelves or put under things to keep them from slipping. In fact, my dad used to keep a piece of this on his dashboard to keep things from sliding off his dash. 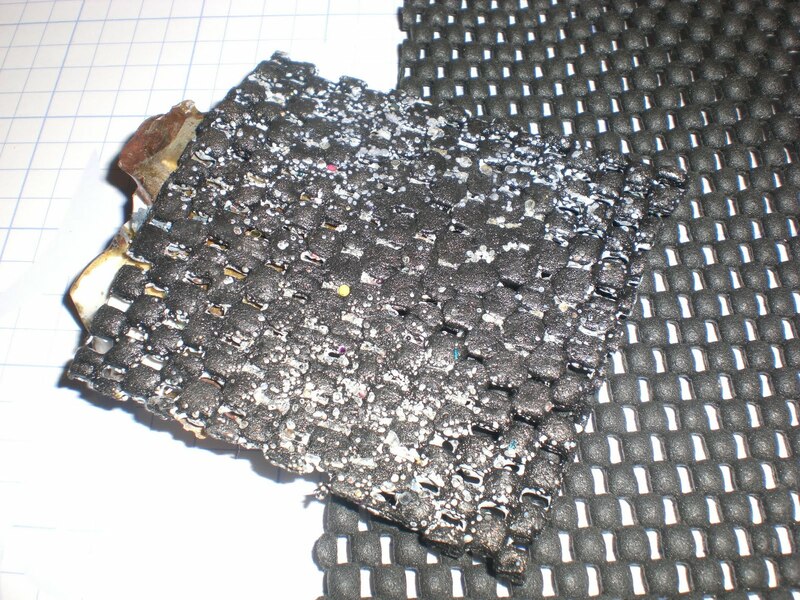 At any rate, if I remember correctly (sorry that I have to keep saying that), we heated the rubber lining added UTEE and melted it. Then we used the craft sheet to create the left piece by inking the craft sheet and using various colors of UTEE. When it was still warm, we manipulated the UTEE to create the dimension. After it cooled we either glued the embellishment on the shelving material or we heated the UTEE on the shelving material and pressed it into the melted UTEE (can't remember). 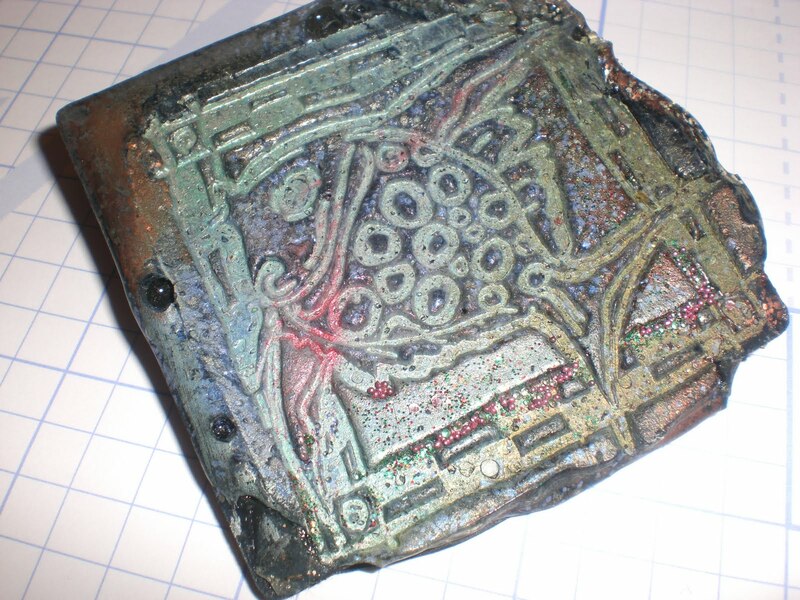 Then we reheated the material and stamped an image into it using a rainbow pigment pad. We also used some of the Ultra Effects and Mini Mosaics. 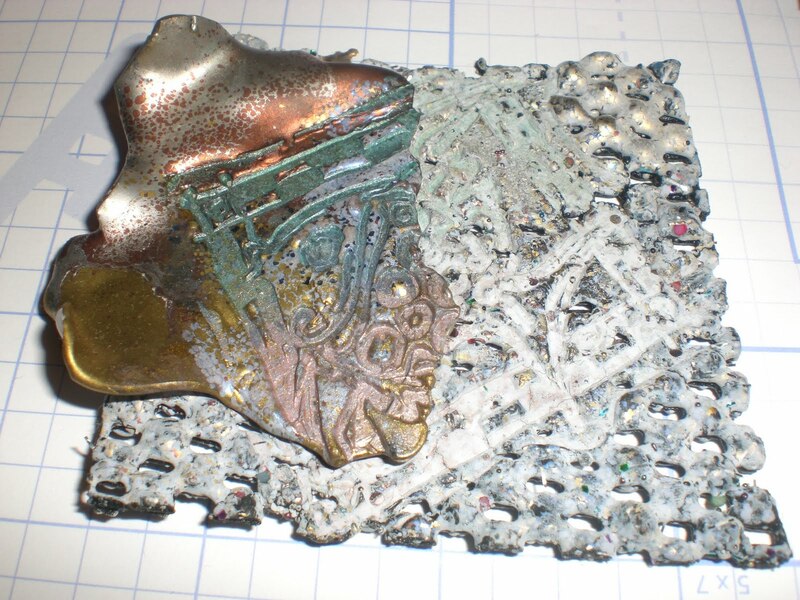 You can see how the liner actually flattens out from the heating and stamping. I took this picture with the project next to some new shelf liner.